When huge and fast steam ships became popular a hundred years ago, there arose unexpected problems with the ships' propellers: Their blades were destroyed by previously unknown forces. It was soon discovered that these destructions were caused by tiny cavities which the propellers created by rupturing the water. This phenomenon, named cavitation, gave rise to a whole new field of research. Cavitation in liquids can occur, for example, in fast flows or strong sound fields, when the ambient pressure falls below a certain value, approximately given by the vapour pressure. Bubbles are created, and grow by the underpressure. Subsequently they show quite different behaviour depending on the environment. They may dissolve again, or grow until they break up into smaller bubbles, or start to oscillate. In a strong sound field, in particular, the bubbles can be excited to such high-amplitude, nonlinear oscillations that they collapse in each cycle to a tiny volume. The strong compression of the bubble leads to a variety of effects: the emission of shock waves into the liquid, catalysis of chemical reactions, high temperatures and pressures within the bubble, and even the emission of light. The latter phenomenon, called sonoluminescence, has attracted much scientific and public attention lately and spurred research in the field. Cavitation is a scientific discipline with many facets. The tiny bubbles display complicated and even chaotic dynamics when driven by a sound field or when interacting with each other in bubble clouds. The processes in bubble collapse and the mechanism of light emission are still not very well understood. Thus bubbles provide ideal objects for basic research. On the other hand, cavitation has many practical and applied aspects with bearings on industrial applications, e.g. Turbines, pumps, ships propellers, nozzles, etc. 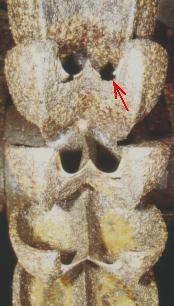 become damaged and lose efficiency when cavitation occurs (The photo shows cavitation erosion at a pelton turbine wheel). A few years ago D. F. Gaitan (in his Ph.D. work in Oxford/Mississippi under the supervision of Prof. L. A. Crum, now Seattle) developed a method to trap a single sonoluminescing bubble within an acoustic standing wave field. With this "hydrogen atom of sonoluminescence" interactions between bubbles are eliminated, and the undisturbed single-bubble dynamics can be scrutinized. Such a bubble trap is realized by taking advantage of a force already investigated at the turn of the last century by C. A. and V. Bjerknes. The force on an object in a liquid depends on its volume and the pressure gradient. Normally this is only the well-known static buoyancy induced by gravitation. In the presence of a standing sound wave there will be an additional gradient, which alternates with the frequency of the sound. Since a small bubble oscillates in phase with the sound pressure - small volume in the high pressure phase, large volume in the low pressure phase - one direction of the resulting force will outweigh the other (see illustration). Hence, the time averaged force drives the bubble towards the antinode of sound pressure and keeps it there. Provided that the sound pressure amplitude is sufficently large, the Bjerknes force can easily compensate gravitation. Thus an acoustic bubble trap simply consists of a standing sound wave in a liquid inside a vessel. The photo on the right shows a cubical bubble trap working with ultrasound at a frequency of 23 kHz. A single bubble is trapped in its center and illuminated by a laser beam. Sonoluminescing bubbles perform anharmonic oscillations, like the one shown in the left film. The bubble radius here is 55 micrometers at maximum. Clearly visible is the strong bubble collapse: it is held responsible for the emission of the sonoluminescence light flash and the shock wave with every period of the sound field. 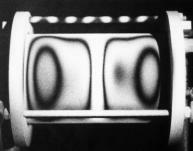 The right film shows such a shock wave propagating 800 micrometers in about 0.38 microseconds (For a better demonstration this film is repeated automatically). The main objective in design of bubble traps is to establish a good resonance inside the vessel. To control its quality there are several methods, employing microphones or hydrophones. With holographic interferometry it is also possible to visualize the modal structure of the vibrations at the surface of the vessel. 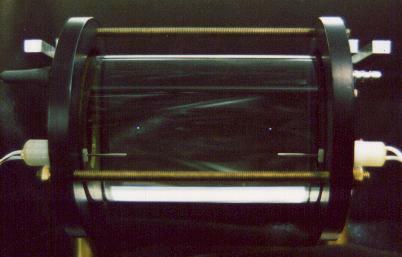 The photo on the left shows a hologramm of a cylindrical trap vibrating in its first overtone, i.e. a mode with two antinodes of pressure. With this configuration two sonoluminescing bubbles can be trapped (photo below). Traps of this kind fill the gap between the study of a single bubble and the study of multi-bubble systems. 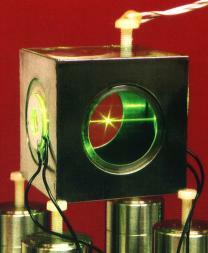 In particular, by this device the effect of emitted shock waves on other bubbles can be investigated. Acoustic bubble traps can be used to investigate the behaviour of single bubbles in liquids as well as few bubble systems under controlled conditions. The aim is to arrive at a better understanding of cavitation phenomena. These are important for sonochemistry and medical applications of ultrasound. Cavitation bubbles also provide a rich laboratory for basic research in nonlinear physics.